Above: George Banis, second from right, receives his best poster award. Below: George talks with NAE President (and former University of Maryland President) Dan Mote. 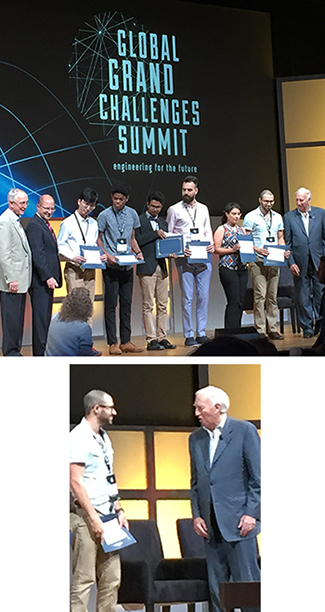 George Banis, a bioengineering graduate student with ISR Director Reza Ghodssi’s (ECE/ISR) research group, has won a poster design award in the student poster competition at the 2017 Global Grand Challenges Summit. The poster title was "Encapsulated biomaterial-enabled microsensor for pancreatic health monitoring." The event, jointly organized by the US National Academy of Engineering, the UK Royal Academy of Engineering, and the Chinese Academy of Engineering, was held July 18-20 on the campus of the George Washington University in Washington, DC. The summit aims to inspire the next generation of engineers, policymakers, and the public to address critically important engineering challenges and opportunities facing humanity. This year’s event focused on the four themes of the NAE Grand Challenges for Engineering: “sustainability,” “health,” “security,” and “joy of living,” as well as education and public engagement related to the Grand Challenges. In addition, bioengineering graduate student Ryan Huiszoon also participated from Dr. Ghodssi’s research group. His poster was titled "Microsystems for detecting and treating antibiotic-resistant bacterial biofilms." Clark School Dean Darryll Pines and more than 20 graduate and undergraduate students from the University of Maryland’s Clark School of Engineering participated in the event.